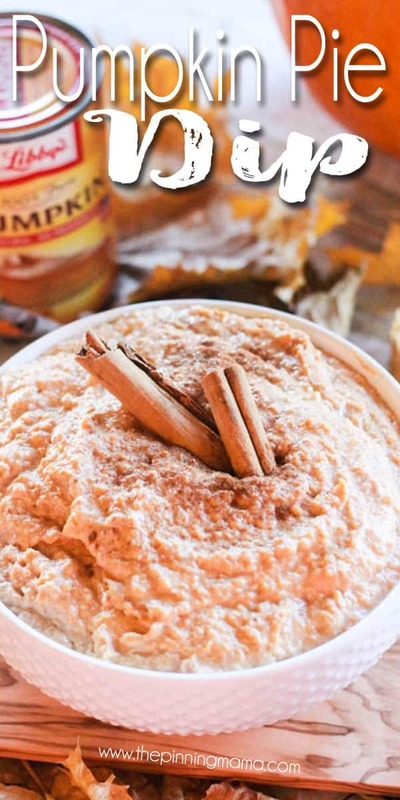 Try this Pumpkin Pie Dip recipe! This is perfect to bring for Thanksgiving or to a holiday party instead of a whole pie since people can snack on it all day. It is also a great use leftover pie to make something new and yummy! 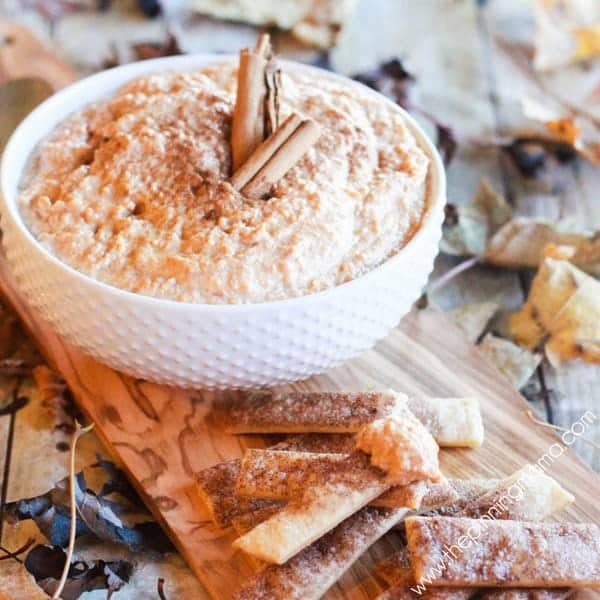 My favorite part might even be the cinnamon and sugar pie crust sticks that you serve it with! One thing I love about the holiday season is pie! There just aren’t that many times of the year that pies are out in fill force, and man they are good! Sometimes though, it is hard to commit to a whole pie. I mean after dinner everyone is stuffed and the whole, huge pie can seem kind of daunting. I could compare it to donuts. (Anything worth saying could be compared to donuts right?!) Sometimes you don’t want to commit to a whole donut, but if donut holes are an option I could eat five of those without thinking! 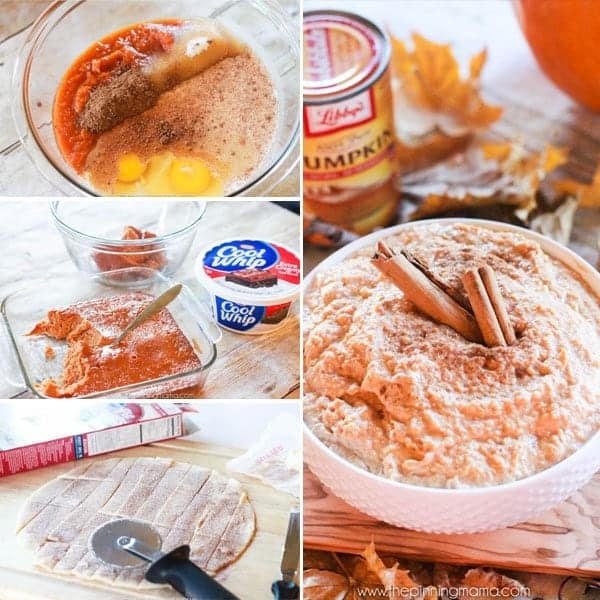 This Pumpkin Pie Dip is the same way! The pie seems like a big commitment, but this dip… now this dip I could just snack on for the whole day. A bite here. A bite there. It is really the perfect seasonal dish to bring to pot luck or have at the office for a fun treat with coworkers. One of the best parts? When you have that pie that seemed like such a good idea but then no one could fit in more than a tiny sliver after dinner and you are left with, well, almost a whole pie at the end of the night. What to do…. 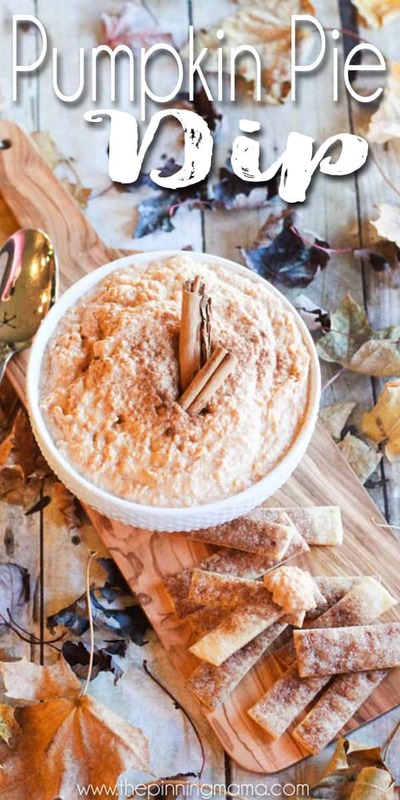 The answer is PUMPKIN PIE DIP! Give that pie a whole new life as a dip everyone can munch on. So you can make this recipe two different ways. One would be using leftover pie as the base, and he other is making a quick pie filling to use as the base. Either way works, but if you already have a leftover pie to get rid of, then it just makes it all the more genius! 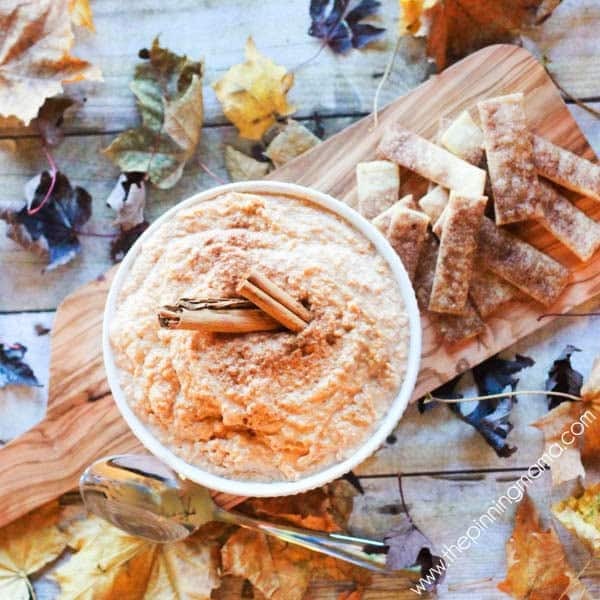 I served this dip with the pie crust dippers in the recipe below, but the thing is this stuff is really great in so many ways! you could dip apples, pretzels, vanilla wafers, or graham crackers in it. Or you could go with a more creative option! I made this recipe about 4 times to get it perfect, before posting it here. Since this resulted in quite a lot of pumpkin pie dip, I brought over a big batch to my neighbor. When I arrived they were in the middle of having breakfast for dinner, and it was crepe night. What happened next was pure genius! They took the crepes, put a healthy spread of pumpkin pie dip on it and rolled it right up to eat. YUM! I bet you could come up with even more creative ways to eat and serve this too! Remove the pie filling from the crust and place in a mixing bowl —OR— Mix the pumpkin, milk, 3/4 cup sugar, and eggs together until well combined. Spray an 8×8″ baking dish with cooking spray, then pour the mixture into the dish and bake for 40-50 minutes or until completely set. When done, remove and cool completely. If you don’t have a prepared pie, you can whip up the pie filling super quick. If you follow my recipe, make sure you use pure pumpkin, not pumpkin pie filling. The pumpkin pie filling already has sweetener and spices in it so you would be adding twice as much as you need if you used this. While the pumpkin pie is cooking, unroll each pie crust and lay flat. Spread 1 tbsp of softened butter and then sprinkle 2 tbsp of cinnamon sugar evenly over the top of each crust. Use a pizza cutter to cut the crust into dippers, by cutting one inch strips then cutting it in thirds length-wise. I tend to like mine on the smaller side so I can get more dip in without double dipping so I often cut them into fourths instead of thirds. Be generous with the toppings. It all bakes in and makes these almost as irresistible as the dip itself! After you remove the pie filling from the oven, heat the oven to 400F. Place the pie crusts onto a cookie sheet and then bake 5-8 minutes or until the crusts are cooked and slightly browned around the edges. Remove from oven and let cool. The crust cooks quickly. Make sure you cook it just long enough to be browned around the edges and hold its shape when lifted. If you cook them too long it will lose a lot of its flavor so make sure to keep a good eye on them. Also, when you take them out of the oven, let them cool a bit before you try to take them off the tray. It will help them not break or bend in the process. Take the cooled pie filling and scoop it into a large bowl, scoop the thawed cool whip on top, then mix the two together until completely combined. Chill until ready to serve. I love to use extra creamy cool whip for this because it gives the dip a certain richness that makes it extra amazing. If you can’t find extra creamy you can just go with regular though. Do make sure your Cool Whip is completely thawed for the best results. Pour the dip into a serving dish, and serve with the cinnamon sugar pie crust dippers. Enjoy! I really hope your family enjoys this as much as we do! As always, if you try my recipes I would love to hear about it! Leave me a comment below or tag me on Instagram to see your creations (@easyfamilyrecipes.) It absolutely makes my day to hear someone enjoying my recipes! Mix the pumpkin, milk, 3/4 cup sugar, and eggs together until well combined. Spray an 8x8" baking dish with cooking spray, then pour the mixture into the dish and bake for 40-50 minutes or until completely set. When done, remove and cool completely.